Tha Gator Boys Make Gator-Aid their Passion! Only a few months ago I looked out the sliding glass door in my home and saw something unusual in the lake. It didn’t look like the egrets that respite at the water’s edge before roosting in the trees for the evening. It didn’t look like a fish that flings itself out of the water displaying a grand expression of freedom. No, what I saw was lurking and cruising along its merry way. It was, as you most probably guessed, an alligator. I jumped online to determine if there were a special message in seeing an alligator midday from my living room window. Alligator ... Let me drop my judgments, Accepting life with grace, So that forlorn care and worry Will vanish from my face. Let me integrate each moment, Digesting life with ease, Counting all my experiences As equal opportunities. The powerful gift of Alligator medicine, I discovered, is to fully appreciate and integrate all that life offers. Gators show us the value of thoroughly digesting both the pleasures and pains of life and recognizing the value of any life lesson. The Medicine Card for alligator asked these questions: Have you been rushing through life and not taking the time to count your victories or to digest your Rites of Passage? If so, it could be time to honor your progress. This message was perfect for me at the time and became an opportunity to embrace myself and life more fully. I was excited to learn that this month I would be getting a much closer look at alligators and especially, and opportunity to spotlight the Gator Boys. The Gator Boys rescue alligators that are a nuisance or in harm’s way and transplant them to safe environments. 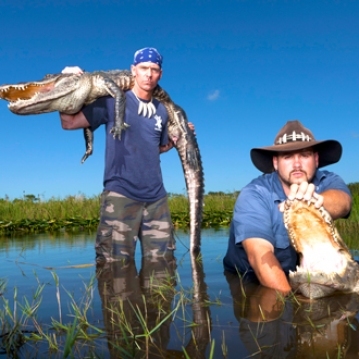 They are located right here in South Florida and without question, it takes serious skill to do what the Gator Boys do. Paul Bedhard is known for his commanding personality and unmatched skill capturing any-sized gator underwater with his bare hands. And Jimmy Riffle has been gator wrestling since he was 11 years old, giving him the ability to stay quick on his feet and handle dangerous reptiles with ease. Their work is thrilling and they’re passionate about what they are meant to do; defend blameless wildlife displaced by urban sprawl and keep people safe. With 30 years of wild-animal experience between them, and a long personal history, Paul and Jimmy are like brothers - meaning they don’t always see eye to eye! “Sometimes wrangling an eight-foot gator is the easy part,” Paul says. And there’s no question that the Gator Boys are just regular guys doing what they love to do. The Florida Everglades is home to hundreds of thousands of alligators so it isn’t unusual for residents to spot gators of all shapes and sizes. Most recently, it was reported that an alligator waddled into Walmart. But we all know they can be lurking in backyard canals or plunging into swimming pools. “Floridians are well aware that alligators can change your day,” as Jimmy puts it. Luckily the Gator Boys are on call to rescue these reptiles from trappers who would otherwise kill them for their skins and meat. Look for the Gator Boys on Animal Planet Media (APM), www.animalplanet.com and the hit series, The Gator Boys. It is filled with non-stop action, monster-sized gators and a realistic view of the interpersonal dynamics that can flare up in life and death situations. Season Four has brought the duo recognition, fame and all kinds of fanfare. Get up close and personal with the Gator Boys at the Everglades Holiday Park in Broward County. You’ll most likely find them in the Gator Pit, filming, wrestling and living their passion. 3. Alligators do not hibernate. They dig tunnels up to 65 feet deep to protect themselves from the hot and cold. 4. The largest alligator ever captured on record in Florida was 14 feet, 3.5 inches. 5. Alligators are found in all 67 counties of Florida, and it is estimated that 1.3 million alligators live in the state. 6. The likelihood of a Florida resident seriously being injured during an unprovoked alligator incident is roughly one in 2.4 million—nearly the same odds as being struck by lightning. 8. If an alligator bites you, the best thing you can do is fight back, making as much noise and commotion as possible. Hitting or kicking the alligator or poking it in the eye may cause it to release its grip. 9. If you try to outrun an alligator – your best bet is to zigzag away… as fast as you can! And speaking of fast, the holiday season is approaching…. Let the prize this month be… accepting life with grace.